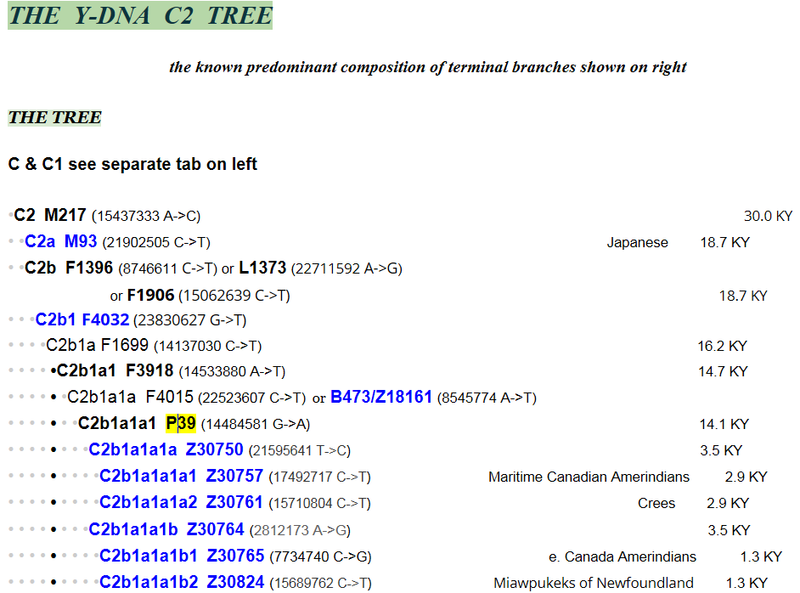 ← Native American Haplogroup X2a – Solutrean, Hebrew or Beringian? This entry was posted in Canada, Cree, DNA, Miawpukeks, Micmac. Bookmark the permalink. This project is only for males who carry Y DNA haplogroup C-P39. You are most welcome to join the American Indian project which is for everyone with Native ancestors. Do Mongolians, the Kazakhstan, Northern Chinese (Manchurian) And another Asians with Y Hg C2-M217 and it’s subclades, allowed to join to this project? Yes, they would join the haplogroup C project. “Unfortunately” i can’t and don’t want to join to FTDNA Y Hg C Project because i am an Indonesian with Chinese Fujianese descendants, Y Hg O-CTS5492 or Y Hg O3a2-P201 +M134 +M117 +M133. But i curious and want to join to FTDNA mtDNA Hg B Forum, if it’s exist and allowed, of course! I am not the administrator of the haplogroup B project, but I’m sure you would be welcome there. But we will not pay for this for it is to your benefit to have people such as we are, that know their ancestry without fairy tales or wild assumptions in regards to them added to your base. I’m glad to see support for DNA testing. Each individual who is interested in testing would order their own test, and would have to provide their own permission to test their DNA, along with payment. DNA testing is an activity that informs us personally of our ancestors and our heritage, and by sharing that information, we learn cumulatively about our human story. The 23andMe nomenclature is years out of date. I would suggest you test your Y DNA at Family Tree DNA so that you have something to work with. Oh, but you said in this article that if you’re C3e at 23andme you’re probably C-P39. Thanks for the article. Interesting. I hope you’ll test at Family Tree DNA where all of your SNPs can be tested. You would want to take the regular 37 marker test and then probably either the Big Y or specific SNP locations. I know it’s more expensive, but 23andMe only utilizes selected locations and then uses old outdated haplogroup assignment names. Unfortunately, that leaves us in the position of having to surmise about a lot. I am currently taking an MTDNA test for the Nancy Hanks dna project. That was supposed to be DNA. Also I am a direct line decendant of Louis Noel LaBauve and Marie Jeanne Rembault. I would like to know where to find more information on the Micmac and Acadien. 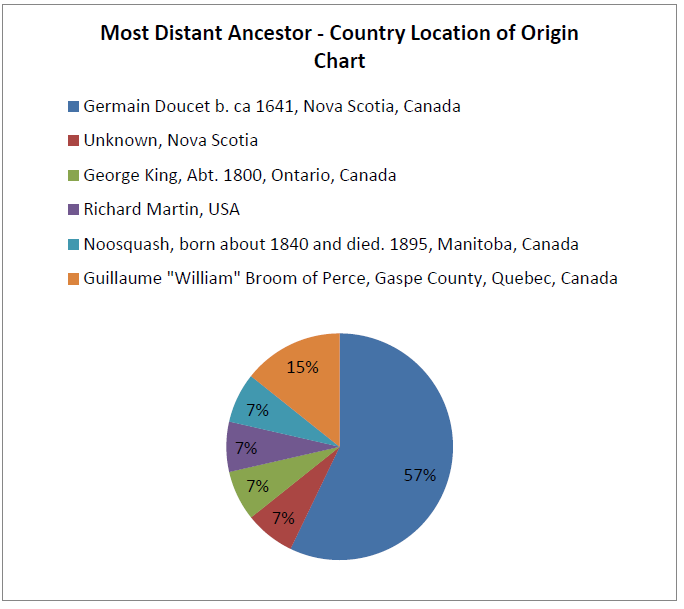 If your mitochondrial DNA goes back to an Acadian line, then yes, mtDNA can help you there. Your mtDNA is that of your mother’s mother’s mother’s line, all the way back through females. 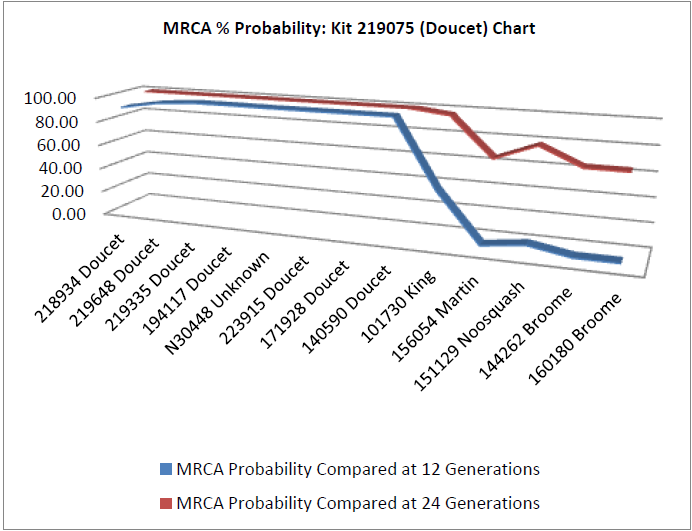 If your mtDNA does not reach back to that line, then no, your mtDNA won’t help with the Acadian genealogy. There is a Rootsweb list that I find very useful relative to Acadian genealogy. To subscribe to the list, please send an email to ACADIAN-request@rootsweb.com with the word ‘subscribe’ without the quotes in the subject and the body of the message. You will receive a confirmation e-mail to try & stop “machine” enrollment spam. You can also join the Acadian AmerIndian project at Family Tree DNA which welcomes people who have Y, mtDNA and autosomal tested regardless of where their Acadian ancestor is found in their tree.